Overall, I see Interstate MAX and the Portland Mall project as missed opportunities to create a great system and not just a decent one. While Interstate Avenue may get revived (though the new Fred Meyer and New Seasons stores aren’t transit-oriented), I worry that it was done at the expense of speed and coverage, which would result in lower operating costs and attract ridership from Vancouver and east of I-5. Especially without service across the Columbia River (a major highway congestion point) and all the way to Vancouver, MAX needs to be high-quality in order to attract travelers off of I-5. A major part of quality is speed. From what I can tell, there was enough room to put it between I-5 and Minnesota Ave. This would have allowed speeds of 55 MPH instead of a maximum of 30 to 35, which is further limited by Interstate’s 4 street jogs. Soundwalls, bridges, ramps and the freeway lanes might have to be changed/moved, but at most 5-10 properties (located north of Lombard) would have to be taken to make the entire right-of-way wide enough for the roadway and MAX north of Greeley. Moreover, ODOT recently did/is going to do some projects (preservation, pedestrian bridge repairs, Delta Park-Lombard widening) which could have been done in sync with MAX to save money. It would have also avoided ripping up Interstate Ave. and building the long bridge (MAX would instead be a part of a new Columbia Slough bridge that’s a part of the widening project). Another way to make Interstate MAX faster was to have less stops. The Overlook and Prescott stations could have been combined into one, located just north of the hospital and closer to more of the neighborhood. If an I-5 alignment was used, it could be located at the Failing Street pedestrian bridge. In addition, the Kenton station could have been omitted, especially with an alignment using the I-5 right-of-way; the area would instead be a short bus ride away from Lombard. Furthermore, using I-5 would have attracted people east of it. Many people are not willing to cross the freeway and then walk to Interstate to reach the line; as a result, MAX essentially only serves areas west of it. In fact, a station located at the Failing Street bridge would even be closer to much of the neighborhood west of I-5, since the bridge is closer to Interstate/Failing then the Overlook station is. Instead of just being close to a hospital, park and edge of a neighborhood, it would be at the center of a larger ridership base. 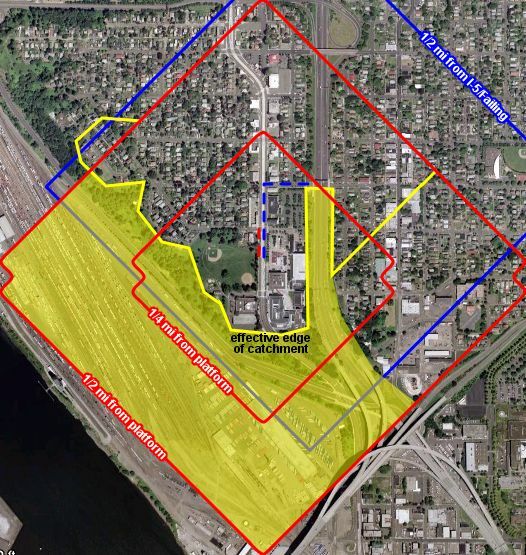 Another example is Killingsworth, where it would be closer to PCC-Cascade. Moreover, many riders (especially the elderly, disabled and those carrying lots of stuff) do not like having to walk farther since their local Line 5 stop was taken out. Seeing that Line 4 is just as close to I-5 as is Interstate, an I-5 MAX line could have allowed Line 4’s hours south of Lombard to be used for shuttles to get people from both sides of I-5 to MAX. Overall, it seems to be designed as if the region ends at the Columbia River. The focus appears to have been on the area west of I-5 at the expense of the east side of it, Vancouver and beyond.